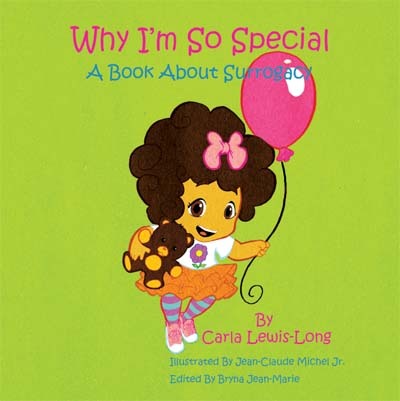 I'm Carla Lewis-Long, author of Why I'm So Special: A Book About Surrogacy. Carla Lewis-Long juggles multiple careers as a television executive, entrepreneur, wife, and mom. Her fertility issues led her to Creative Family Connections, which helped to find a wonderful surrogate to carry her baby. This children's book is a story for all parents who used a surrogate to share with their young children, to let them know just how special they are. This story is ultimately about hope, perseverance, and lots of love. This is Carla's first children's book. This book tackles a very difficult, complicated subject in a sweet, whimisical way. A lighthearted picture book on surrogacy. Why I'm So Special, A Book About Surrogacy With Two Daddies, tackles a very difficult, complicated subject in a sweet, whimsical way. It is a lighthearted picture book on surrogacy with two daddies. The book is a story that all parents who used a surrogate may share with their young children to let them know just how special they are. This story is ultimately about hope, perseverance, and lots of love.